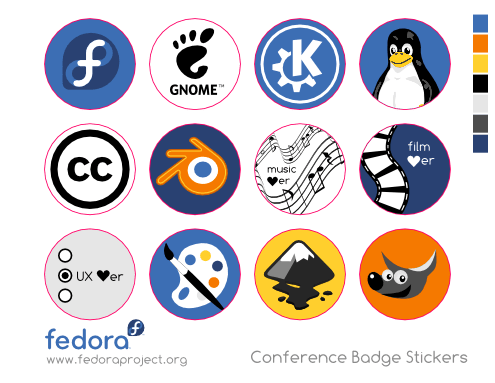 Fedora is going to have a booth at the South-by-Southwest (SXSW) music, film, and interactive conference expo in Austin, TX in just a little over a couple of weeks now. Why are we going? Well, our plan is on the Fedora wiki, but my main goal in attending is to promote free software to all of the designers (and developers, too!) that will be attending for the interactive conference, and hopefully even drum up in them some interest in getting involved themselves and help them get started. We do not have enough designers in the free software community, and I believe we desperately need them. Are we going to find them at the Linux and free software-centric conferences we attend every year? Unless they’re already a member of our community – no, probably not. Are we going to find them at SXSW? I believe so – a show like SXSW is a far more natural habitat for the folks we need! ‘Creative Hands’ image on Open Clip Art Library – I remixed it from Asrafil’s ‘Free Culture’ design. The idea here (I think it was originally Spot or Emily’s idea) is to have a postcard we hand out at our booth, with four slots to be stamped on the back. The expo is four days long – March 14-17 – so the idea is that we’ll have a different stamp for each of the four days. Folks who want to enter our contest for a sweet prize (TBD) will need to come by our booth each day to fill out their stamp cards to be eligible. These are the designs for the stamps themselves. 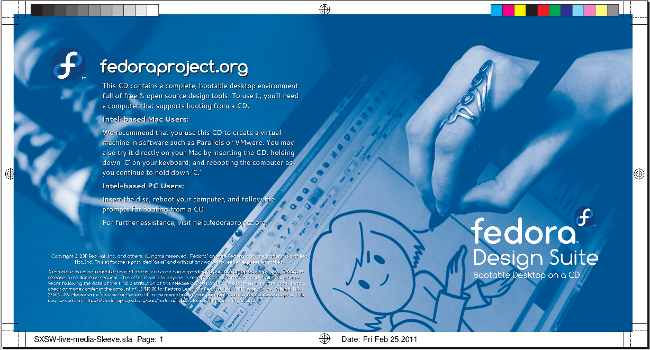 We are going to have updated versions of the Fedora 14 Design Suite available as handouts at the booth. They’ll have our highlighted apps and of course tons more pre-installed. With John Biebel’s help, we figured out that they won’t boot on newer Powerbooks, but Matthew Garrett helped us figure out a couple of workarounds to suggest for Mac-bearing folks who want to use the discs to try Fedora out. 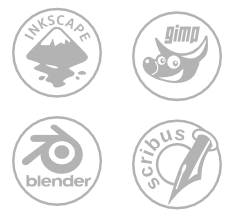 We’d also considered putting together some discs with cross-platform installers for the free creative apps, but time and budget constraints led to us dropping that. We wanted to have some type of sticker handout – from perusing folks’ photos from previous SXSW events, stickers seem to be a really popular handout. So we made these little icons – I’d first seen this style of sticker at LGM in 2007 – that folks could stick on their badges to give a bit of their personality. It seems most sticker vendors, first off, will not produce a sheet of multiple die-cut stickers – instead they want to do rolls of a single sticker design. So finding a vendor who could even do sheet-style stickers was rough. Then, when you get into vendors who can do sheets, many do a lot of business printing labels – for sticking on jars and various other form-factor products. The most popular (in the US) form factor for these label sheets to come in is 8 1/2″ x 11″ US Letter size sticker paper, and the vast majority of these vendors’ dies seem to be made for this size paper. We wanted a small, easy-to-stow-away form-factor for our sticker sheets, no larger than 5″x7″. Not only would this cause die charges as most places don’t already have dies for this, but it would cost a lot in paper since they’d have to cut down a full 8 1/2″ x 11″ sheet to make one 5″x7″ish sheet. So the vendor we ended up with, Consolidated Label, is going to cut down each 8 1/2″ x 11″ sheet of 1″ diameter die-cut stickers into four smaller sheets for us. We’ll actually end up cutting through two rows of unused die-cut circles to do this – but for about a third of the cost of getting the same number of sheets at the same size. I hope they’ll come out all right. They are a pretty serious vendor though; they do work with some pretty big, well-known clients. I was really, really happy when they called me to tell me a change needed to be made to the color of some of the text to make it more readable – I thought I was going to have to send them another draft of the file but they told me no need – the Scribus-produced PDF I sent them was apparently clean and easy-to-work-with and they were able to make the change for me. P.S. I love this wallpaper. The birds by Emily look even better scaled down a bit like this. Hope this or very similar makes it to the final. 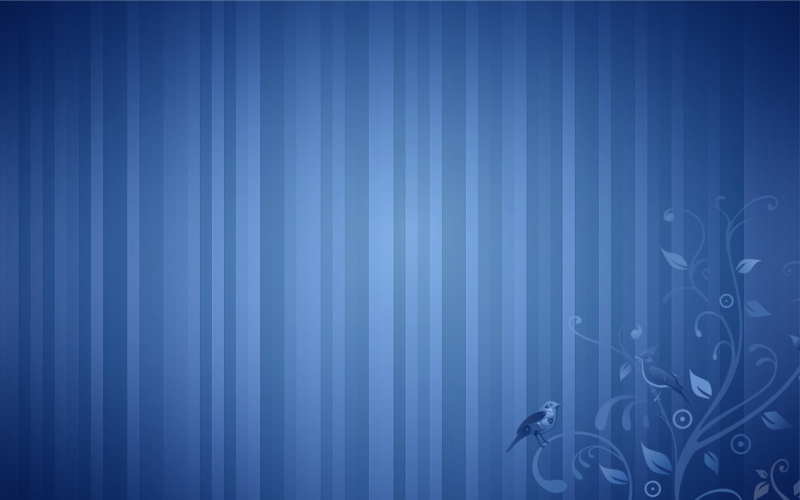 Most professional/beautiful fedora wallpaper ever? So this is cool! I’ll be in Austin for SXSW, but I don’t have tickets… so I probably won’t be able to stop by. Unless those aren’t required. With this kind of spirit we are going to rock the place in LGM too ! Hi Dylan, thanks for the reference anyway! If you can think of other fonts to highlight let me know and I’ll be happy to blog them and file requests for them! This is really exciting! I love your initiative and hope you will have a great response on SXSW. This is brilliant stuff. 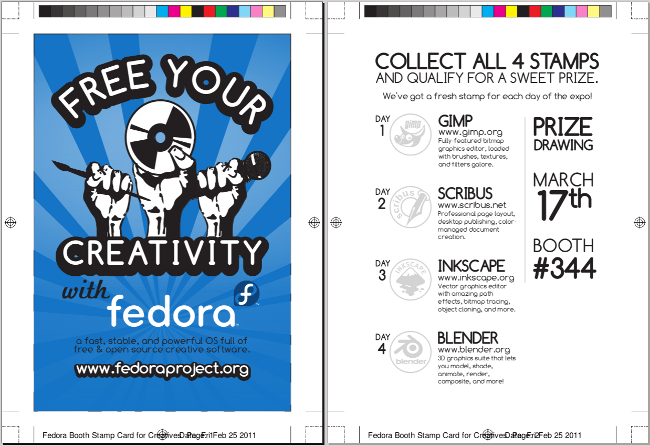 I hope SXSW is a huge success for Fedora. Thanks for doing all the legwork to make that a possibility! Glad to hear Fedora’s going to SXSW. If you have the time, I’d enjoy seeing a blog post on your thoughts about the greater Linux / open source community’s issues with attracting designers and the other design issues that affect the community, e.g. too many cooks, inconsistent UIs, beta-quality software in the repos, etc.